Had a craving for something sweet last night. I was out of maple syrup which I need to make my Maple Walnut fudge, so I tried something a little different. Added walnuts and white chocolate. Definitely a keeper. Smooth and creamy with just a hint of white chocolate. Add the two sugars, butter, cream, corn syrup and salt into a sauce pan. Place over medium heat. Stir while bringing to a boil. Lower the heat and continue to stir slowly while the mixture cooks. After about 7 minutes, test by pouring a small amount into some cold water. You want it to form a soft ball. (about 235°F to 238°F on a candy thermometer) When it reaches soft ball stage, remove from the heat, and let rest for about 10 minutes. TIP: By letting the fudge cool for 10 minutes it reduces the stirring time. After 10 minutes, add the vanilla and the white chocolate and stir until the white chocolate melts. You will notice the the fudge starts to thicken almost immediately. Stir another minute or two or until the fudge starts to lose its shine. Quickly add the walnuts and pour into a buttered dish. Oh man... my thighs are getting bigger just looking at that fudge! I love fudge. 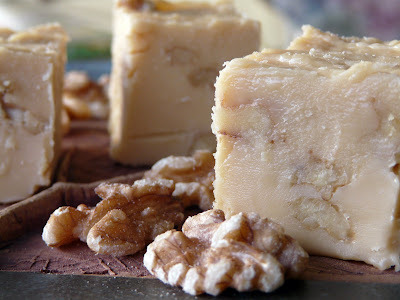 I actually make a great chocolate or peanut butter fudge using velveeta cheese! Got the recipe from Paula Deen and it is great. I like fudge as well, peanut butter is probably my favorite. I've had the Paula Deen fudge; it's interesting, I think. 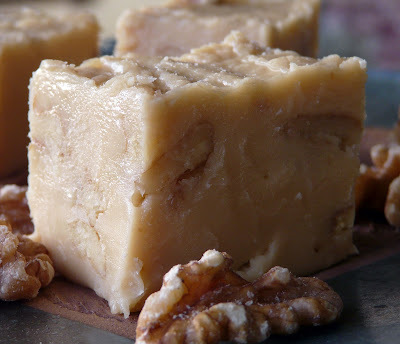 I've been thinking about penuche lately. I just may have to act on those thoughts, grins. Ann I just made cookies with your fudge..:) So good! Thanks again.. This looks so good and creamy. I'm afraid I could eat several pieces at once! Yum! Hi Ann, it's Phyllis Philodendron! Imagine my surprise (well, not really!) at running into your beautiful blog on the Web - I had no idea. You are so talented! That fudge looks really good! Is the maple syrup in the fudge recipes real maple syrup or the kind you put on french toast? I was looking for some good fudge recipes, thanks! 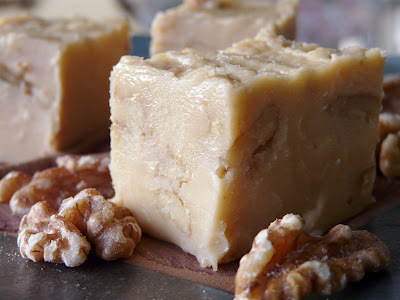 Now if I can just figure out how to duplicate the caramel pecan fudge I sampled in town recently life will be complete. can I ask, can you freeze this? Michele, I haven't frozen fudge. Only because it never lasts long enough around here to freeze. But I know others that have frozen it without a problem.